It is a great tool for end user and easy to access. Even a beginner can use it without any guidance. Compared to other tools in the market which is used for process mapping, this one is a very good and best tool in the market. User-friendly tool for BPM workers. 1st time license for Igrafx is a great risk and while using it via shared license it is very difficult to save and open file to reuse the existing file. Previously we have not worked on the mapping tools, but have known about other mapping tools like Blue prism. This was easy to access and was able to achieve the required goal in our project and have achieved client satisfaction. It's really an excellent application to explain a process in a diagram model which means it shows the step by step process/ activity for every step and easily to understand the others to review the process. Short and easy formation to understand and no need to describe every activity fully which confuse others to learn. It explain an activity in high level which means we are using the key level activities to be placed over the activity boxes few of the terms might be missing while entering the process details rather every tools that used here was excellent. Process map covering the end to end process in easy manner. The person who reviewing the process map getting easy to understand the step by step process. We are creating a process map by covering the end to end process in easy manner. The person who reviewing the process map getting easy to understand the step by step process. iGrafx provides a succinct and easy way to capture and document process relationships. This provides a clear view of ownership and a method for understanding impacts of change and the appropriate communication paths. We have not encountered anything. They are continually updating the tool to provide functionality. For anyone who has compliance or regulatory requirements, iGrafx is the best product for you. Auditors required that we have a clear way to capture process information including both authors and owners. Additionally the documentation needed to be able identify what changed between versions and who made the change. "iGrafx was the way to go"
I use iGrafx to create workflow diagrams. It is easy to use and and required almost no training to get started. I have not had any problems with iGrafx. I would say that iGrafx is easier than Visio to adopt and implement but with 100x the power and capability. The Process for Six Sigma client is a great for simulation of your process and for testing hypothesis of improvements before implementation. This allows us to implemtent correctly the first time rather than have the impact and cost associated with having to back out changes. There are lots of options provided in this tool, compared to other mapping tools iGrafx provides Template categories like Process, Value Stream Mapping, Lean Sigma Tools. Mapping template provides various alternatives which is much easier. Navigation for this tool is way ahead that other mapping tools. Even though there are lots of technological advancements in Tech industry taking place. Igrafx could be updated in terms of automation, Optical character reorganization and voice recognition to compete industry tools. Good process mapping to document processes and add value to the process. Since I could capture the oral and written processes as a Flow chart, I could use this for future reference, I could use this process map to automate the process. 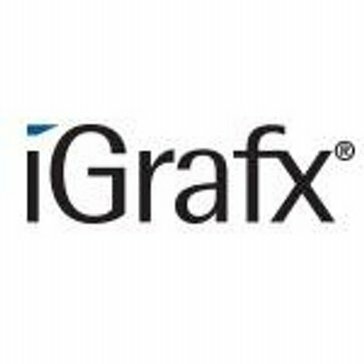 iGrafx is one of the best Business Process Management tool in the industry which helps to design the flow of a process and identify/map all risks, controls, gaps, opportunities, etc., related to the process steps The best thing about iGrafx is the out can be exported as a PDF as well. It also helps in doing a value stream mapping which will help identifying and eliminating wastes and enhance the delivery. IGrafx is the best tool for understanding process flow. Unless, normal flow chart, iGrafx tool provides different boxes for better understanding. Apart from decision boxes it also provides gateways, Instead of explaining the scenarios the gateways depict the exact scenarios. The predefined boxes, Sub process process with linking facility helps the user to understand the process in a easy way. Even though iGrafx provides the needful information, it can be improved by few changes by accepting the reviews from the users. Whenever the new box is inserted or copied it will update only in the middle of the page instead of having it in the exact location.This can be made userfriendly. This is the easy tool to explain the process to the client in the layman point of you. Without much training any one can use this tool. Once the mapping is done, it can be converted into PDF format and that will be helpful in client presentation. Instead of explaining the process with the help of the tool/application it is the easy way to explain the process with the map in iGrafx. Even without training anybody can depict simple maps in iGrafx. It is easy for me to explain the steps to the client with help of iGrafx,more time will be saved and clients are satisfied with the flow. "iGrafx easy way to use"
iGrafx tool - it's easy way to use. We can create process mapping without any issues. It's really using like as MS paint , we just drag and drop activity boxes and decision boxes predefined box. We can easily drag and update it all the boxes. It's really identify process steps. Good tool to use process mapping. Compared to others mapping tool it is best way to use process mapping tool. It's really amazing tool for using process mapping tool. We can more options to use and easy to understand for all the people.It is very easy to use and useful for documentation. It is simple and easy to adapt to. Simple drag and route arrow functions. Easy to recognize icons and boxes. Simple layout and easily manageable swimlanes. It is very easy to use and useful for documentation. It is simple and easy to adapt to. Simple drag and route arrow functions. Easy to recognize icons and boxes. Simple layout and easily manageable swimlanes. iGrafx is really i would say it's good applciation however we can imporve little bit more. Sometimes it's automatically closed. Also sometimes it's shows username and password when we are opening iGrafx tool. AMAZING tool with lot of functionality with easy navigation. Works with lot of shortcuts. I do not like the transition from the process input to the connections. It is hard to make connection points from one end to another. So far there is nothing I dislike but sometime I got some printing issues.Sometimes the template will print very large with excessive white space depending on how many swimlanes are being used (4 swim lanes seems to align perfectly for a standard process map but 5 swimlanes and more makes the page unnecessarily big and make the texts look small and hard to read unless zoomed in). Always make sure the user is using the correct template. Also the page sizing and margins might be tricky. Simple tip for users is to simplify the work by reducing the amount of swimlanes as possible to keep the page standard size or figure out a way to shrink the size of the page regardless of how many swimlanes. AMAZING tool with lot of functionality with easy navigation. Works with lot of shortcuts. If you are in process mapping, I highly recommend you switching to iGrafx because it will make your input of processes much easier and simple. There are instructions that are easy and can be done be anyone. iGrafx tool that we are using for processes six sigma is a greta for simulation of your process and for testing hypothesis of improvements before implementation. We can identify risk and controls and update it easily. It's using business operations sectors. It's realy reduce error and 100 % quality if we using iGrafx tool. It does a splendid job for documenting processes within a business. It also gives universal icons that can be recognized within similar businesses. Making organizational charts for our clients is not easy and effortless using iGrafx. I needed to document our processes for training of new staff. iGrafx allowed me to easily capture our current process making it simple for employees to understand. It helped us to understand our current state processes and also helped us the measure the impact of change. "iGrafx Process Mapping Uniqueness "
"I use igrafx at work everyday as a process engineer for USAA"
It is very easy to use and useful for documentation. It is simple and easy to adapt to. Simple drag and route arrow functions. Easy to recognize icons and boxes. Simple layout and easily manageable swimlanes. Lack of tutorials and guidelines when running into issues. The page margins are tricky and hard to use. Sometimes the template will print very large with excessive white space depending on how many swimlanes are being used (4 swim lanes seems to align perfectly for a standard process map but 5 swimlanes and more makes the page unnecessarily big and make the texts look small and hard to read unless zoomed in). Always make sure the user is using the correct template. Also the page sizing and margins might be tricky. Simple tip for users is to simplify the work by reducing the amount of swimlanes as possible to keep the page standard size or figure out a way to shrink the size of the page regardless of how many swimlanes. It does a splendid job for documenting processes within a business. It also gives universal icons that can be recognized within similar businesses. "iGrafx a complete mapping tool"
iGrafx is a very useful mapping tool with almost all mapping options and is very useful for Business process modelling.All options and shapes used for mapping can be used and is an useful tool for business process mapping. Has varied six sigma tools, VSM and customization of maps possible. Some shortcuts are not possible or not easy to operate. I would like a guide for options and a list of short cuts. If available please let me know. But overall the toll is awesome and has no flaws. Highly recommended tool for process mapping. I would recommend to all beginners as this is a simple tool easy to learn and use. Using the tool on a daily basis for all process mapping utilities. Best way to capture process steps in a presenting manner, which helps us to view and modify process maps later. EPR provides cloud storage which helps us locate process maps to update and modernize maps. Cloud storage is very slow to work with and it delays the delivery of work. Due to cloud maintenance they restrict the usage of site, which might lead to work stoppage. Capturing process maps in details helps us to develop the processes, through which we can work on the automation of the documented processes. "Great for creating organizational charts"
iGrafx is a nice tool to create workflow and charts diagrams like organizational charts. The software has many great features including the smart objects tool that I see essential in making diagrams. iGrafx is simple to use and editing previous charts is so easy without any issues. So far there is nothing I dislike but sometime I got some printing issues. I highly recommend iGrafx! It is easy to use and saves a lot of time and effort. iGrafx allowed me to quickly document my process with almost no learning curve. I was able to watch a few tutorials online and was up and running. I have not had any issues with the iGrafx software. If you are looking for an easy to use modeling tool, this is the one. "Most needy tool for my Job!" A very simple platform to use. We can collaborate from mobile devices or browsers. One of the best tool for process mapping. Scalable - supports secure IT environments also. When we copy paste an existing process map to a new map, the systems are getting deleted once we save the file. It is a duplicating time consuming work for me to add again the systems to the new map. is there a way to curb this issue? I do business process mapping with my clients through igrafx which is very easy for me use. My core job is process mapping now using Igrafx. "iGRAFX.. Best Mapping tool ever"
AMAZING tool with lot of functionality with easy navigation. Works with lot of shortcuts. "I use iGrafx on a regular basis." I do not like the transition from the process input to the connections. It is hard to make connection points from one end to another. If you are in process mapping, I highly recommend you switching to iGrafx because it will make your input of processes much easier and simple. There are instructions that are easy and can be done be anyone. I am evaluating current state processes and creating future states for our customers. * We monitor all iGrafx reviews to prevent fraudulent reviews and keep review quality high. We do not post reviews by company employees or direct competitors. Validated reviews require the user to submit a screenshot of the product containing their user ID, in order to verify a user is an actual user of the product. Hi there! Are you looking to implement a solution like iGrafx?